… is hard to put into words. Perhaps beginning with deconstructing my blog’s name is a good place to start. Casita Colibrí is the name I’ve given my little rooftop studio apartment. Why? Because my terrace is surrounded by Tulipan trees (AKA: African Tulip; Sorcerer’s Wand; Flame of the Forest). 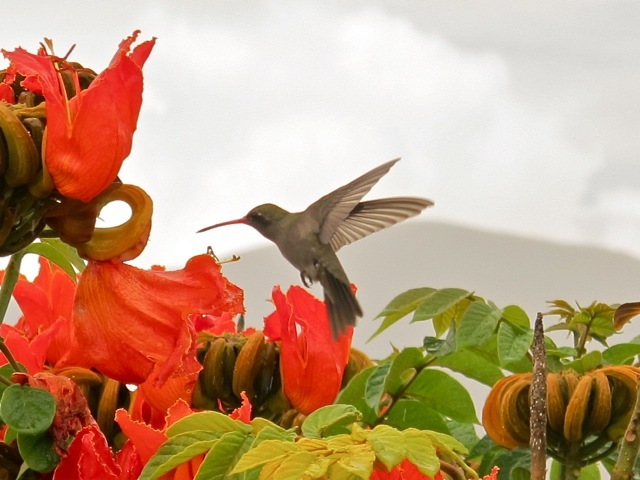 Their brilliant orange-red flowers are a favorite of the hummingbird — colibrí, en español! And so, in July 2009, when I began nesting here, I had no choice — colibríes to the left of me, colibríes to the right; I was (happily) stuck in the middle with them! How did I wind up in Oaxaca? The privately funded library, where I’d been the director for almost 13 years, lost its funding and closed in spring 2009. Full time jobs for librarian/archivists in the San Francisco Bay Area were almost non-existent. Faced with the choice of working multiple part-time and substitute jobs to barely keep my head above water, versus renting my house and moving to Oaxaca to live a downsized and simplified life, in a culturally rich, full of life city; there was no choice! Well, the choice wasn’t THAT easy! It took hundreds of emails, phone conversations, and all around emotional support from a friend who kept reminding me, I had options. My friend, G, had retired at age 50, traveled the back-roads of the world, and eventually settled in Oaxaca in 2000. I’d visited several times and had fallen in love with this small, people friendly city, and thought eventually I might retire here. An early retirement seemed to be forced upon me and, within 2 months, I’d decided to be brave, seize the opportunity, and make lemonade out of lemons! Once the decision had been made, relief, peace, and a ton of hard work followed. With the assistance of a network of wonderful and supportive family and friends, I sold, donated, and gave away 2/3rds of my belongings and placed my home of thirty years on the rental market. The question of where to live in Oaxaca was settled in February 2009, when G discovered the neighboring studio apartment would be available to rent. Having a close friend pave the way in the transition to a new city, in a foreign country, has been an immeasurable help. And no, I didn’t speak Spanish, not even close! My Spanish language skill was limited to two years in high school — a couple of lifetimes ago. I’ve always wanted to learn to speak another language and the move here has provided me with the perfect opportunity. It’s not easy, but it’s another page in this work in progress…. Update: I’ve been living and loving my life as an expat in Oaxaca for almost five years now. Do I have any advice for others considering an expat lifestyle? Check out an interview with yours truly on the Expat Blog, American Expat Living in Mexico – Interview with Shannon. So good to get these Oaxaca updates Shannon! I think about you from time to time and really I am quite envious. This Blog is terrific, keep it coming. You may have done this, but could you post a Google link/map of where the heck you are? I picture you being about 100 miles up in the mountains from the coast, but…. Muchas gracias… link to Google map has been added! No, don’t want to post my address… map is just for locating Oaxaca on the planet. Shannon- I just spent the last hour reading your blog and looking at your pictures and it literally swept me away and made me dream of that hot sweet air. You are a fantastic writer and i can see you’re in a place of inspiration! Good for you and even thou I don’t really know you, you have inspired me. Keep up your blog- it is so fun to get away. Jeannie, glad you like it… thanks for stopping by! Hi Shannon – small world – I’m from the Bay area too and moved to Oaxaca the same month you did! But I came from inside Mexico from a gig training Mexican English teacher near Toluca. We’re using the same Template on wordpress too! Sheri – What an amazing series of coincidences! By the way, I went on a 3- week road trip through Chiapas a year ago and bought a cape, skirt, blouse, and belt/sash from a roadside stand near Zinacatan… so beautiful. My favorite sight was watching girls play basketball in full traditional Zinacatan dress. My best friend (since age 12) is coming to Oaxaca Feb. 15 for 10 days… she was a textile design major at UC Davis. Would love to get together with you while she’s here. Brave and courageous decision! I have just arrived in Oaxaca for an extended stay and Im really enjoying your blog and all the information its providing me! Well done on taking such an amazing step in life, Im sure it is all working out for you! Kerryn – Welcome to Oaxaca! Thanks for the kind words and if you have any questions, don’t hesitate to contact me. Hi Shannon – is your friend still here who was a design major from UC Davis? I’m sorry not to have seen your post until now – it didn’t come to my e-mail box. Anyway we might have a mutual friend – Dolph Gotelli – a professor there – now retired. Let me know if you want to meet – that would be great. I love Chiapas and am going back for 2 weeks the end of March. Zinacatan is the best! I’m documenting their textiles for another ‘rescate’ (revival) article – see my first – Mazahuas de Santa Rosa de Lima – in my blog. I love getting the new posts from your blog. It makes me excited to return to Mexico. I want to explore Oaxaca and other parts of the country, when I return. Both of my sisters have been, so I must go. I just love the vibrant colors. Thanks so much. Looking forward to meeting you when you find your way back down here! Lovely blog from a lovely city! Your “about” section was a delight to read as are the blog posts. The Henestrosa “Manos que crean y ojos que leen” exhibit at the Henestrosa library knocked my socks off. Old librarians never die…. I will enjoy reading future posts, thank you. Hey there Shannon – found your blog this am and it was so nice to see your beautiful pictures! It looks so sunny and clear -I can hardly elieve we were just there because it sure is rainy in Oregon. Can’t wait to be your neighbor again in December! Thanks, Stan. High praise, indeed, and much appreciated! Kay, I’m not sure what kind of information you want, but here are a few observations: It’s close to nieves at the Jardín Socrates and, in the other direction, the zócalo is only 5 minutes away. However, quiet it is not! though it varies from street to street. Cohetes are known to go off at 6am to celebrate something or other, traffic cops blow their whistles incessantly, church bells chime several times a day, various amplified concerts are held at the Plaza de la Danza (several years ago I heard Lila Downs from the comfort of my terrace! ), announcements are made over the loud speaker at a nearby school, and the usual shouts and sound effects of the gas and water vendors occur regularly. It’s all part of the flavor and I’m not sure there is any place in the city that is quiet. There is a crummy Soriana (supermarket) nearby, but there are yummy mercados even closer for fruits, veggies, eggs, meats, fresh tortillas, tamales, etc. As you may have gathered, I love it here! ¡Muchisimas gracias! Love your blog, too — am now following. Here we are living 100 yards from each other, and I am sending you a comment electronically! I loved Panchco Claus and your great photos. And even though we live so close and go to the same zócalo for the same events, we see different things. I know, itsn’t it amazing. Btw, my friends in Soldotna want me to give you their contact info. before you return. See you around the ‘hood! Ah, I just enjoyed soaking in so much of your blog! My man, Todd, and I will be visiting Oaxaca for Semana Santa this year and our usual over-planning research style (ok, MY style) led me to Casita Colibri. We share your appreciation for street art and murals, and the joy of small scenes and people watching. Thank you so much for sharing your love for Oaxaca. Over-planning research? Music to this librarian’s ears! Thank you for your very kind words. Looking forward to meeting you and your man, Todd, during Semana Santa. Please stay in touch! Will do! Our plans are already too ambitious for the short time we have to visit Oaxaca. Baseball, street art, food, ruins, bike riding, hiking….I’m so excited! Hi Shannon, I just found your blog looking for an English version of the story of Donaji which we’ve just returned from watching. I guess it would have helped a little if we’d read about the story first, though it didn’t matter all that much – we were able pretty much to figure it out and the whole production is quite spectacular. Very glad we went. We’re in Oaxaca for Guelaguetza and a week beyond that. Our solution to retirement was to become nomadic. So far so good. ¡Bienvenidos a Oaxaca! It’s a very special place that has completely captured my heart. Let me know if you have any questions or would like recommendations. Enjoy your adventures in wonderland! Since October of 2012, Robert Adler and Tom Feher have been interviewing and photographing migrantes from Central America and Mexico on their way to El Norte. Their project is called I Have A Name, is designed to document their struggles and show the dignity, humanity and courage of the migrants. It will be traveling to various venues in the United States. Learn more about this remarkable project and how you can be part of it by going to http://www.indiegogo.com and putting “I Have A Name”in the search box. Great project! I know Robert and Jo Ann and would be delighted to publicize it. It’s a busy time around here, but I’ll try to post it on the blog in the next few days. I’ll also send you an email for future reference. Shannon — beautiful blog! Found it by accident but hope to give it a good thorough read. I once lived in Oaxaca… and visit regularly. Do we know each other? I knew a lovely Shannon there — wondering if you are she? Many thanks for your kind words… they are much appreciated! I think you probably knew the Shannon who moved to California right before I moved to Oaxaca. For the first couple of years I lived here, several people would mix us up! Perhaps we can meet on your next visit. When did you move there, Shannon? I was there from 2000 to 2003. So some time ago now… Sounds like you have a wonderful “perch”from which to observe that most lovely of cities… Thanks for sharing it with us! 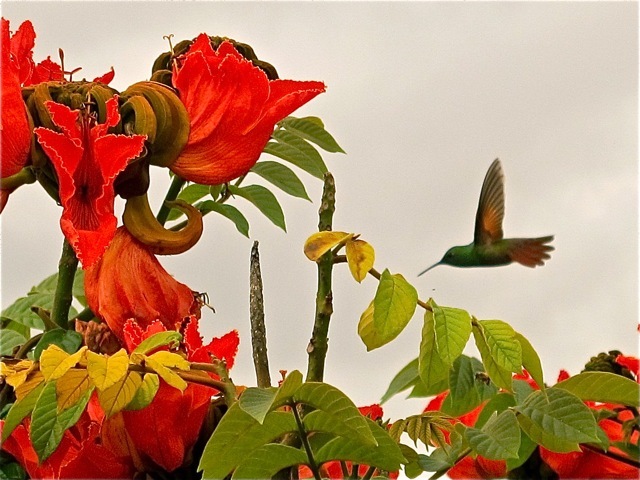 This is a wonderful blog, we are visiting Oaxaca at the end of December for a 5 day trip. I was hoping if you could give us some tips on places to eat and visit in Oaxaca and also some day trips out of Oaxaca. Appreciate any guidance you can give us. Many thanks for your kind words; they are much appreciated. Thursday: Zaachila (this one also has a large livestock market — fun for a child, as you can walk among the animals) At the main market, ask for directions to where the livestock market is located. Friday: Llano Park in Oaxaca City and a small, peaceful Organic Market on the plaza in front of the church in the Xochimilco neighborhood on Fridays and Saturdays. Saturday: Oaxaca city at Mercado de Abastos – the already gigantic market almost doubles in size. Pickpockets are rampant here. There are way too many delicious places to eat, to list all, so I’m listing just a few of my favorites. Upscale: Casa Oaxaca, Pitiona, and Los Danzantes. Moderate: La Biznaga, La Zandunga, and La Olla. Marco Polo for seafood; La Gran Torta for pozole; La Popular for tortas; Gio (in Col. Reforma) for French inspired daily comida corrida; Cafe Brújula for coffee/tea and cookies. Also, if you go to any of the above listed weekly markets, plan to eat there. Wow, you are precisely the kind of American I want to interview for my study of Americans learning Spanish in Mexico!!! If I can meet with you for a few minutes, about 30, to learn more about how your Spanish acquisition is going, that’d be fantastic!!! Your posts are inspiring!! Hi Melisa, I would be happy to speak with you. Are you in Oaxaca? Love your blog…we are here until mid-February….we seem to be interested in similar things and places…would love to meetyou but I don’tknow how to get in touch with you…. Barbara, Muchisimas gracias. I’ll email you privately. I have discovered your blog a month ago or so right after I came back from my one month trip to Oaxaca. It was my third visit; the first one being 20 years ago!! I find your blog really insightful and the pictures are great. Anyway, by chance, I looked at your blog today and discovered that you are visiting the Bay Area. If you have some time to spare, let me invite you for a cup of coffee or a drink. I live in Glen Park and work in the Mission. I would be thrilled to meet you but I understand if you are too busy. Awesome blog–thank you! Your images are inspiring, and I really like the thoughtful and light quickies on the text side too. My husband and elementary-aged kids are on the prowl for where to live in Mexico for a year, given my current remote worker job. (Why sit tight?) Starting to think about a reconnaissance visit down to Oaxaca. Could be the one. I wonder if you know anyone, bloggers or otherwise, who have kids with them in Oaxaca, maybe in a bilingual school? Mine have no Espanol skills apart from counting to 10. Also, does it look like there will be this fast highway to the coast finished anytime within the next 15 months..? Thanks again for your postings. Thank YOU for reading my blog and for your kind words! Oaxaqueños love children, though the public schools leave much to be desired. There are ex-pats with kids who live or have lived in Oaxaca. You might want to join and put your question to the Facebook group, Clandestine Oaxaca Appreciation Society There is a Waldorf School in Oaxaca, Papalotes and on Facebook . As for the highway to the coast… I wouldn’t hold my breath. 😉 If you have other questions, please don’t hesitate to ask. Hi Shannon ~ Subscribed to your lovely blog when I put Oaxaca on my shortlist for living in 2015. … would love to tap into your settling-in expertise in advance of my arrival. … Mzuri. Mzuri, I sent you a you a private email. What beautiful writing! Your photos and descriptions painted bright colors in my imagination. I spent hours glancing through your pictures and reading your blogposts. I’m currently learning Spanish and trying my best to master the language. It’s such a pretty language and Oaxaca sounds gorgeous. It’s refreshing to hear something nice about Mexico besides how terrible it is there and how many murders there. Thanks for blogging! Muchisimas gracias for you exceptionally kind words! Mexico is a welcoming and mostly safe place populated by warm and beautiful people. Mucha suerte in your writing and your quest to learn Spanish. Llevo mucho que no pasaba por aquí, me agrada saber que siga siendo hermoso este blog y que encontremos información sobre nosotros. Un abrazo. We quite enjoy your blog about living in Oaxaca, it is very interesting and informative. Would it be possible to interview you to further share some of your tips and feature some of your first hand experience as an Expat and your interview will be published on our Expat Interview section as a guide for our expat readers. The questions are mainly about the day to day lifestyle of an expat. If it would be possible, could you also send some photographs that we can use? Your photos are beautiful! I can’t wait to get stuck into reading this blog! Muchisimas gracias. And, I can’t wait to get stuck into reading your blog! I am giving thanks today for my recent, fabulously enriching trip to Oaxaca with my sister for our annual “Deer Hunt” trip; the guys go hunting, we take a trip. It had been 18 years since our last visit to Oaxaca. We faithfully read your blog and it helped us set our market days and also keep us up to date on the news, whether tragic, curious, funny. Thank you for taking the time to keep the information coming. Viva Mexico! Thanks so much for the commentary on a beautiful city. Will look forward to hearing more, and I am a huge Lila Downs fan. Feliz Navidad! I have been living full time in beautiful Playa del Carmen for two years and am changing my visa status so I don’t have to leave every 180 days. I currently have a friend that goes back and fourth from Destin, FL to Playa every 3 weeks so have been depending on him to bring me stuff and also, use his address as my USA address and for a mailing address for the little snail mail I get. I do not like depending on others and getting them to do my bidding. How do expats handle US mail, receiving Amazon stuff, etc.? 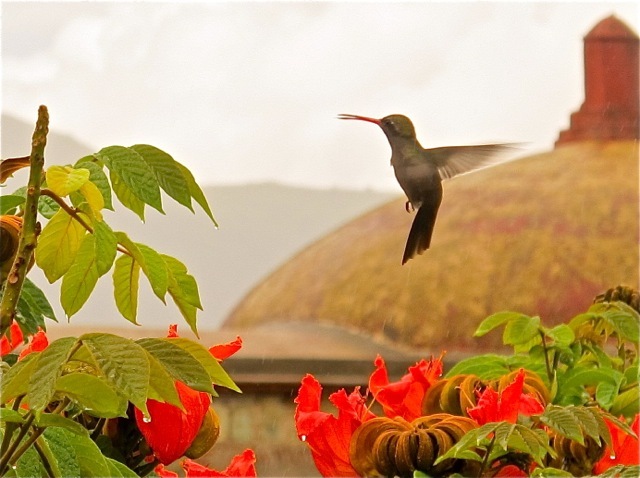 Thank you for sharing your wonderful musings of Oaxaca life. I’ m married to an Oaxacan decendent and lived some wonderful years in Mexico almost 20 years ago and I can just imagine how warm it makes you feel. Since then we have returned to Mexico every year, but not Oaxaca. Until now very soon and with our children. We will be around for the Guelagetza, and I am really curious how the city changes that week. We wonder if the dances on the Mondays are also attracting for children aged 7,11,12,15, since it is a really long show, or are there also other things going on, not necessarily having to attend the dances? Could you recommend us something? Thank you very much, and keep up the inpiring blog! I live in Mazatlan and have for over 12 years. I would like to discuss linking our websites about Mexico. I believe it could be advantageous to both of us. If you have any interest in hearing about this possibility, drop me an email at murry_page@yahoo.com and I will respond with the specifics. I could not find your email address, so I had to resort to using your comments. Thanks for taking your time to read my email. Just looking around your blog it looks like a beautiful place to live. I’ve been reading your blog for a while and love the photos. I’m an English teacher at a university in Miahuatlán de Porfirio Diaz and want to share my experiences with more people. I would love to ‘cross promote’ by doing or giving a short interview or simply by listing each other in our blog rolls. Please feel free to ask any questions and take a look at my site. I hope you keep on enjoying Oaxaca. I haven’t found an email address where I can contact you. My husband and I visited in 2014 for Dias de los Muertos and fell in love with Oaxaca. Though we are both long in the tooth (80 & 68) we are seriously interested in moving there as soon as possible. We will be visiting again in October of 2016 and will be staying for 3 months. Can you tell us where (on the internet) we could find info regarding living in Oaxaca? Perhaps a bilingual rental agent? We plan to rent and, hopefully, somewhere near el centro. We are also concerned about the hot months of April and May. Is there a way to escape the heat? I don’t think there is much, if any, air conditioning available, correct? Re rentals, a few suggestions: 1) Join the Clandestine Oaxaca Facebook page People often post apartments for rent and, when the time gets nearer, you can post what you are looking for, i.e. date available, rental amount range (pesos or US$ but be clear which), # of bedrooms, etc. 2) Craigslist Oaxaca 3) You might want to sign-up to receive the Oaxaca Lending Library weekly newsletter , as it has classified ads, often listing apartments/houses for rent. Thanks for the suggestions! I’m using all three. The Facebook page has so much information I could hardly stop reading it. NOW I feel like I can learn what I need to know before moving there. I am a US artist working on a photography project about US citizens who have relocated to Mexico. I found your blog on Expatsblog.com, and I hope you don’t mind me getting in touch. I’m interested in talking to a US citizen who moved to Mexico to enjoy the opportunities, high quality of life, and/or lower cost of living. I’m looking for someone who relocated by land (not plane), if possible. I am not looking to take their portrait, but would like to take a photograph of their point of departure from the US. If this description fits you, or someone you know, I would love to exchange a few emails or talk briefly via phone. I am happy to send you a copy of the finished book and credit you in the acknowledgments. Unfortunately, I don’t think I fit your profile, as my move to Oaxaca was accomplished by airplane with 2 suitcases and a backpack. I too was able to enjoy the kings procession and to see all the happy children riding new bikes and trikes the following morning. For me it happened this year in Malaga Spain, where I have been the past month. Some years ago we shared curry that had been overly spiced, at least for our palets, at The Royal Thai in San Rafael. Funny in hindsight, not so funny as we tried to put out the fire. I enjoy your insights. Keep up the good work. Shannon, I just wanted to take a moment to express my gratitude for your tireless blogging efforts. What a resource for people visiting Oaxaca! It seems that everything interesting I’ve found I learned from you and Chris Stowens 🙂 I spent just a few days there in December and fell in love. I will be back in town in early February for more eating, cooking and hiking (with hoofing it in oaxaca, which I hear meets at the Oaxaca Lending Library). But what I’ve yet to find is a great place to learn about events like the concerts you just listed in your latest post. How do I find out about gems like this?? I’ve been using quepasaoaxaca.com, but they don’t have much there. Worry not, my Spanish is fluent, so I’m fine with Spanish web sites. And thanks again, Shannon. Blogs like yours are truly a gift. Muchisimas gracias for the very kind, not to mention, encouraging, words! Oaxaca is definitely a special and inspiring place. Unfortunately, every since Margie Barclay retired from doing her calendar, there doesn’t seem to be anything to pick up the slack. Besides checking quepasaoaxaca.com, I subscribe to the weekly newsletter of the tourism office: http://us10.campaign-archive2.com/?u=d0fb8aa863b552c8b18f809ea&id=0171c0d52e&e=f701035754 But, it, too, leaves a lot to be desired. I heard about the concert from my neighbor, who is a good friend of Casa Colonial’s owner. Word-of-mouth and posters tacked up on doors help fill the gaps. Una reverencia de gratitud, colibrita! What a great idea! Thanks for the invitation. That would be me that put you on that list! And now I’m looking to interview you for the series Mexican blogs worth reading! If you are interested, please send me an email to surivorinmexico@gmail.com and I’ll send you the details! It’s the second one. Oops! I’ll send you an email! I am passionate about Mexico and live vicariously through your blog! I have become friends with an artist who lives in Oaxaca de Juarez and works with a collective in the Sierra region. The artists live far from the usual tourist markets. I’m writing about Tropical Storm Beatriz that recently devastated the Sierra region. I’ve heard from my friend that there’s no clean water and little food or medicine. I’ve tried to help but am wondering if there are groups that can provide assistance locally? I understand there was a march organized today to raise awareness. I hope this helps. Thanks for any advice you can give. I know you love not only the art, but also the artists. Hi, i saw that in some of your articles, you posted some works of Raul Lopez Reyes, the artist from Michoacan who works the paper mache. I would like to ask if you can help me, his telephone number, because i would like to know more about him. Hola, I am considering coming to visit Oaxaca to see if I might like to retire there. I am a retired RN, wanting a life change. I do not speak Spanish at the moment but would like to learn. I have done a fair amount of travel in my life but not the last 15 years. I find that I am a bit nervous , and could use a little nudge. I would be coming to a city where I know no one and do not speak the language. I would so appreciate a few tips on how to connect with others when I get there. I might have a place to rent but it is on the outskirts of town, so I hope I can figure out how to get around. Can you suggest a reliable place to learn Spanish? I would also like to do some volunteer work there , maybe with children. Might you know, how would I go about finding volunteer opportunities? Any tips you could share would be greatly appreciated. I would like to firm my plans soon so I can come right after the holidays. There are a number of Spanish language schools in Oaxaca that you can find on the internet. I don’t have enough experience to recommend one over another. As for making connections, I would suggest the Oaxaca Lending Library There is also a Volunteer Oaxaca website: http://www.volunteer-oaxaca.com/category/hints-and-tips/ Best of luck and hope to meet you after you arrive! Do you know where one can find a chapel or statue of Juquila in Oaxaca City? There are images in the Basilica de la Soledad and the Cathedral. There are chapels in Atzompa, Monte Albán, and Santa Lucía del Camino and possibly a church or chapel on Calle Azucenas in Col. Reforma. I think I’ll put tracking them all down on my 2019 agenda! Thank you, Phyllis. The feast day for Santa Isabel is July 8, so the days of celebration should be around that. In June, you might want to start monitoring Facebook pages from Santa María Coyotepec to see if a schedule is posted. Good luck!